Yes, Amazing Spider-Man 2 is just about out of theatres. I just finally got to see it though. Let me just say this: If you haven’t seen it yet and have a chance to catch it in the theatre… wait for a friend to buy it on DVD To say I was disappointed is an understatement. 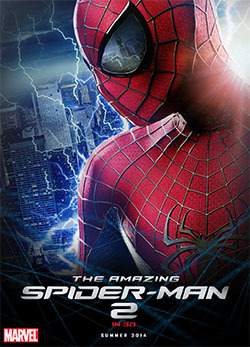 I wasn’t a real fan of the first Amazing Spider-Man movie but I really thought from the previews that this one would be better. We start off with a super cool and suave Peter Parker. I’m sorry but especially early in his high school career, he was anything but cool. I know there is some artistic license but changing the personality of a character is a bit much. The only time he is awkward is when he’s talking to Gwen Stacy. Then there’s the topic of Gwen Stacy. She was quite a know it all. The fact that she just happened to know the system in the building that was needed to defeat Green Goblin was really pushing it. And that doesn’t even start to touch her relationship with Peter. That was just painful to even watch. There’s awkward that’s fun to watch and then there’s awkward that makes you want to walk out of the theatre. I was there with a friend and he was even more frustrated than I was. The movie is a lead in to the Sinister Six. The main villain was Electro. Jamie Foxx as Matt Dillon was as annoying as the Gwen/Peter relationship. The was a socially awkward stalker geek who would give all other geeks a bad name. No one really likes him and he has some sort of crush on Spider-Man. (Yes, more cringing.) It isn’t until he actually becomes Electro that he stops being totally annoying. The effects for his electrical form and such are kinda interesting but he still doesn’t seem to have the strong personality that I’m used to in the comics. Then we have Harry Osborn. We’re introduced to him as we find out his father Norman is dying of a genetic disease. Harry takes things over after Norman’s death and happens to start showing signs of the disease right away. He tries to get Spider-Man’s blood to cure himself but Peter won’t give it to him. He tries a serum Oscorp had which mutates him, but luckily there happens to be some armor that is a perfect fit for Harry. The armor has the flier attached for the standard Green Goblin look. This leads to the classic Green Goblin vs. Spider-Man battle involving Gwen Stacy. Harry finds out Peter is Spider-Man which means that his friend denied him the blood he needed. The battle over Gwen takes a different path but is still a good battle and leads to the expected death of Gwen. This part was one of the few enjoyable things in the movie. Harry is sent off to jail but has some equipment from the area where he got his armor send on to someone else. This leads to the appearance of the Rhino. Unlike the Rhino most people know, this one is in a huge suit of armor the size of a small tank and the rhino head is a big lid that flips open. It looks really stupid. (At least the Doc Ock arms that were in there look better.) A kid in a Spider-Man suit runs out to stand up to the Rhino and the Rhino just stands there. Then the real Spidey shows up, talks to the kid, gets the kid back to his mom, and all this time, the Rhino just stands there and watches and lets this all happen instead of taking advantage of it. Really? “Hi. I’m a bad guy but I’m going to suddenly wait for innocents to clear out this time and make it a fair fight.” I really don’t see that. There is so much wrong with this movie. Seriously, I’d be afraid to know how they could make it worse. This has some of the worse casting. I wasn’t happy with the recasting of Peter Parker in the first movie and the return of Sally Fields as Aunt May is just terrible. Jamie Foxx should never have been used. (What is it with recasting all these caucasian characters with black actors lately anyway?) Even the casting of Harry was barely passable. To make matters worse, the “extra scene” for the movie was just an ad for X-Men: Days of Future Past. It didn’t even have anything to do with Spider-Man. *facepalm* I really hope there isn’t a third movie in this line if this is how bad it’s going to be but with the lead-up into the Sinister Six, I’m betting they will. They should stick to the Avengers line. I just hope they do better with Doctor Strange whenever they get to that.